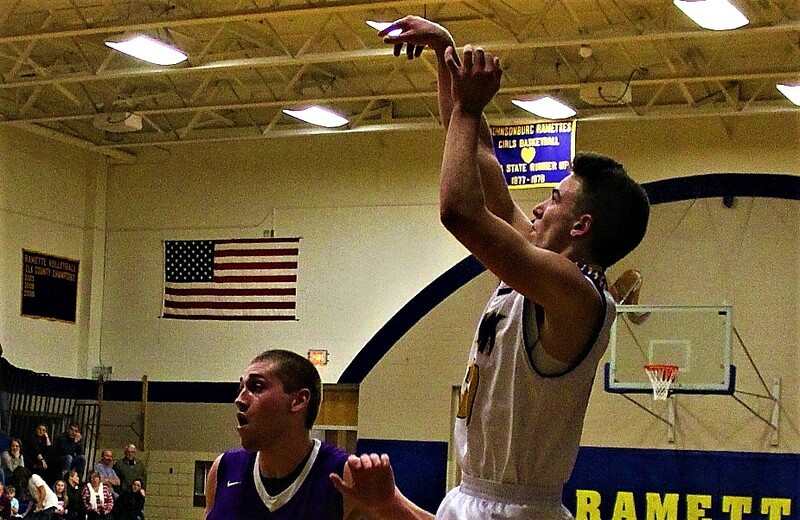 JOHNSONBURG, Pa. – Johnsonburg used a balanced attack and a quick start to pick up a big win over visiting Coudersport, 49-46. Austin Green had 16 points, Dilen Surra 14 and Kacey Raubenstrauch 12 for the Rams, who led 12-6 after a quarter and a 22-17 at halftime. Owen Chambers paced Coudersport with 19 points with Jared Green adding 18. SLIPPERY ROCK, Pa. – Nick Wherthey hit a long 3-pointer at the end of regulation and then outscored visiting Keystone, 4-3, in overtime to pull out a 46-45 win. Wherthey had 12 points to lead the Rockets while Mitch Houston and Logan Croll each added nine points. Dalton Jones had a game-high 14 points for Keystone with Corey Rapp added nine points, nine rebounds, four assists, four steals. DUBOIS, Pa. – Justin Miknis exploded for 33 points on 13 made shots to lead DuBois Central Catholic to a 70-61 win over visiting A-C Valley. Brandon Walker added nine points for the Cardinals with Thomas Grecco added eight points. Dalton Callander scored 17 points to led A-C Valley with Russ Carr adding 11 points and Eddie Stevanus 10 points. SHINGLEHOUSE, Pa. – Marcus Brown netted a game-high 25 points to lead visiting Cameron County to a 55-49 win at Oswayo Valley. Adam Shaffer added 14 points for the Red Raiders. Gavin Babcock led Oswayo Valley with 28 points with Theo Henry adding nine points. WARREN, Pa. – Andrew Davidson hit four 3-pointers and scored 18 points to lead Warren to a 62-45 win over visiting Bradford. Steven Knowlton led Bradford with 14 points with Danny Manion adding 10 points. ULYSSES, Pa. – Conner Van Gorden scored 21 points to help Jasper-Troupsburg to a 54-43 win at Northern Potter. Foster Kosa 15 led Northern Potter with 15 points with Carter Anderson adding 14 points. WEST SUNBURY, Pa. – Jared Lomenski netted 17 points and Ross Tenney scored 13 points to lead Moniteau to a 49-28 win over visiting Commodore Perry. Ethan McDeavitt added 10 points for the Warriors.